Long Island, NY, August 28, 2012, WRCN 103.9 Rocks a little younger! WRCN-FM 103.9 Long Islands true local Heritage Rock Radio Station is changing for the times. The station is adding a touch of mainstream rock to its huge music playlist. Calling the change "a slight format tweak", VP of programming Charlie Lombardo said, "I am proud of what WRCN is and how we serve our Long Island listeners and this change is really a reflection of the changing Long Island demographic and what they wanted". "The station has new life and new energy and our playlist is truly the rock of Long Island" added VP, COO Vic Latino. In addition to the newer music and mainstream mix, the station announced the addition of a brand new morning show. The Real Radio Show will debut on September 4th at 6am. Hosted by radio veteran Frankie Dee, along with his sidekicks Henry K and Twisted Sister member A.J Pero, the show is a high energy mix of comedy, music, celebrity interviews and worldwide entertainment. The show will also devote a segment to local Long Island talent, making it the only radio station in the tri-state area to devote prime time morning drive to unsigned indie bands. Joining the cast on the debut show will be Kiss front man Gene Simmons. Farmingville, NY – Get your platform shoes and your bellbottoms out of the closet! 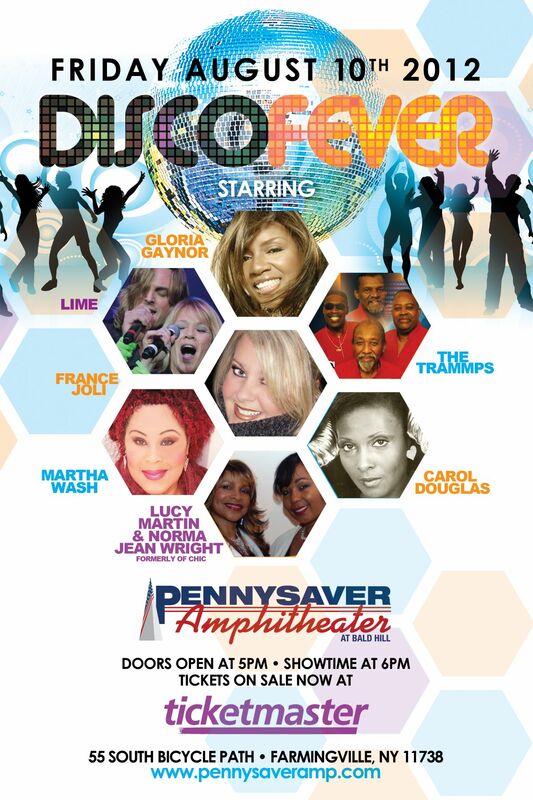 Coming this Friday August 10th to the Pennysaver Amphitheater it’s a 70’s invasion staring Gloria Gaynor, Lime, The Tramps, France Joli, Martha Wash and more as they take over the big stage at the Pennysaver Amphitheater. Also on hand will be huge disco fan, Teresa Giudice, star of the hit TV show Real Housewives of New Jersey. The music superstars will be joined on stage by the star of the hit TV series Real Housewives of NJ, Teresa Giudice. Teresa will be signing her new book, posing for pictures with fans, dancing on the great lawn and encouraging fans to sample her new designer cocktail. Long Island Events is the new operator of the Pennysaver Amphitheater formerly known as the Brookhaven Amphitheater. Long Island Events has committed to bring fun high quality, low cost entertainment to Long Island, and this show is going to top the FUN list! Gates for the show open at 5PM and the show starts at 6PM. Permanent seating and lawn seating is available at Ticketmaster. No food or beverages are permitted at the Amphitheater, a full concession and bar is available. The Pennysaver Amphitheater at Bald Hill, formerly The Brookhaven Amphitheater is located on Bicycle Path in Farmingville. Please visit www.pennysaveramp.com for more information on the venue and a full schedule of upcoming events. 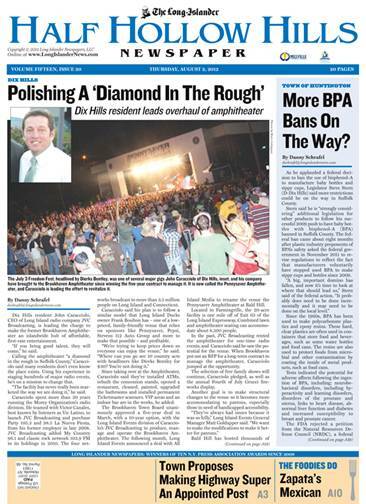 Enjoy this week’s issue of The Long Islander’s Half Hollow Hills Newspaper. … full newspaper in PDF format attached.